Position in Shared Reality Lab to develop the infrastructure for an open-source social media analysis engine. The McGill-IEEE Symposium on Advanced Electric Vehicle Drivetrains to be held at McGill's New Residence Hall on Friday November 14, 2014.
International Training Scholarships/Stages Internationaux continue to be available through FRQ-NT's Stages Internationaux Program. The NSERC Collaborative Research and Training Experience (CREATE) Program supports the training of teams of highly qualified students and postdoctoral fellows from Canada and abroad through the development of innovative training programs that encourage collaborative and integrative approaches, address significant scientific challenges associated to Canada's research priorities, include the acquisition of professional skills, and facilitate the transition of new researchers from trainees to productive employees in the Canadian workforce. Professor Mahajan is an assistant professor in the Department of Electrical and Computer Engineering. He is a graduate of the University of Ann Arbour, Michigan, where he completed his PhD in Electrical and Computer Engineering in 2008, and then went on to complete a post-doctoral fellowship at Yale University. CIM-REPARTI member Professor Tal Arbel and members of her group at CIM are featured in the Faculty of Engineering Dean's Newsletter Fall 2011. Bioengineering is booming at McGill! Professor Arbel's Probabilistic Vision Group works with Montreal Neurological Institute researcher Louis Collins to find ways to match ultrasound images acquired during brain operations to the pre-op MRI, thus providing the surgeon with updated MRI pictures to use for guidance — pictures that have been corrected for the shift. Her lab is also collaborating with Collins and Dr. Doug Arnold, a neurologist, to develop new imaging techniques for multiple sclerosis, a degenerative disease that attacks and leaves lesions in the brain, predominantly in the white matter. Preparing for the Bioengineering Revolution! 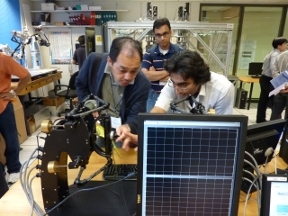 Professor Tal Arbel, accompanied by her PhD student Nagesh Subbana, are featured in the inaugural Engineering eBulletin, September 2011 edition. This article highlights some of the collaborative work in image-guided neurosurgery that Professor Arbel and her group do with researchers and neurosurgeons at the Montreal Neurological Institute. Congratulations to Prof. Joelle Pineau, who is both a CIM and REPARTI member! Dr. Pineau's work the Smartwheeler, a smart wheel chair that is designed to help people with disabilities get around, is featured in the Summer 2011 edition of McGill Headway magazine. CIM is extremely pleased to announce the addition of Prof. Aditya Mahajan as Associate Member of our Centre. Our own MRL group has developed a robotic drone that flies itself by looking at landscape below. Featured in IEEE Spectrum, December 12, 2010. We are most pleased to report that our colleague, Professor Joelle Pineau from the School of Computer Science, joined CIM as a full member in May 2009, after having been a CIM Associate member for four years. Joelle is also a member of Regroupment REPARTI. We were very pleased that Paul Kry, Assistant Professor in the School of Computer Science, joined CIM as an Associate member this past year. We are pleased to announce that Dr. Renzo Cecere has recently been accepted as a new Associate Member of CIM. TEACHING THE WORLD TO SING - AS ONE An ambitious experiment at McGill University is trying to bring live opera to cyberspace, through an unlikely pairing of engineers and classical singers. The idea is to simulate what it would be like if each were performing in different countries simultaneously over the Net for millions of spectators. The World Opera Project, the brainchild of Norwegian historian and opera aficionado Niels Lund, who was also on hand for the experiment Wednesday, hopes to be able to broadcast such an online opera by 2012. For the engineers, the project is about serving the artists' technological needs. But opera's jump into 21st century technology would also provide lessons for less challenging cyber-endeavours, improving everything from video conferencing to telesurgery, said Jeremy Cooperstock, an engineer with McGill's Centre for Intelligent Machines. SURVIVAL OF THE MACHINES: ARTIFICIAL INTELLIGENCE AND SINGULARITY In the movie The Terminator, set in the not-too-distant future, computers become smart enough to break free of the tyranny of their human masters. Of course, the computers round up and kill the humans. It doesn't look like a lot of fun in the movie. A few researchers at McGill's Centre for Intelligent Machines are working toward a moment that feels inspired by science fiction: a tipping point when smart computers themselves become capable of creating smarter computers, at a speed and in a direction we cannot predict. That moment is the Singularity. Among the scientists who see the Singularity as, at least, plausible is Benoit Boulet, a robotics researcher and director of the McGill Centre for Intelligent Machines. Boulet's colleague at CIM, Jeremy Cooperstock, teaches AI at McGill. He has a more guarded view of the Singularity than does Boulet, but, as he explains, "The potential for one of these areas to do harm is such that we should look at these doomsday scenarios and consider them." I am thrilled to announce that some of the work done by Vincent Levesque and members of our Haptics Laboratory, under the direction of Professor Vincent Hayward, is featured in the New Scientist Print Edition, 25 October 2008. The article features joint work being done by our Haptics group and colleagues at UdeM on tactile graphics for the blind. The article is entitled: "Pinching display lets you feel the data", and is based on a paper presented at ASSETS 2008. The Shared Reality Laboratory of CIM, under the direction of Professor Jeremy Cooperstock, has numerous positions available. We are most proud to announce that one of our CIM PhD students, Vincent Levesque, was the winner of the "IEEE Technical Committee on Haptics Best Demonstration Award" at the 16th Symposium on HAPTIC INTERFACES (March 2008). Julie Payette, who pursued studies in a PhD program with Profs. Vincent Hayward and Renato DeMori of CIM, will be aboard the space shuttle Endeavour for a mission planned for April 2009. Congratulations are in order for CIM member Professor James Clark, Director of the Visual Motor Systems Lab, and his PhD student Li Jie. The "New Scientist" magazine has posted an article about their work on its website. Professor Clark and Ji Lie have designed a novel way to think about designing games to control how players notice enemies and other features. We are proud to announce that Michele Faragalli, Master's student under the supervision of Prof. Inna Sharf, has been selected to participate in Expedition Delta to the Mars Desert Research Station (MDRS) located in Utah. These positions have been filled. Check back again sometime for future oppotunities at CIM. Congratulations to Dr. Vincent Hayward, Director of the Haptics Laboratory of CIM! Our CIM Students continue to do us proud. Please join me in congratulating our CIM students who were awarded Precarn scholarships for the year 2008. We are extremely pleased to announce the addition of Louis Collins, PhD, Faculty member of the Brain Imaging Centre (BIC) of the Montreal Neurological Institute, to our Associate Membership affiliates of CIM. It is a both a pleasure and an honour to welcome Gilbert Bruce Pike, PhD, Director, McConnell Brain Imaging Centre of the Montreal Neurological Institute to our CIM community as an Associate Member. Dr. Pike has a long and established history with our Centre, collaborating with CIM Faculty member Prof. Kaleem Siddiqi on numerous publications, co-supervised students and grants. Vincent Couture (PhD student in SOCS) and Michael Langer (CIM member) won a best paper award at the Computer and Robot Vision Conference for their paper: "Can Lucas-Kanade be used to estimate motion parallax in 3D cluttered scenes?" CIM member Kaleem SIddiqi won the McGill University Carrie M. Derick Award for Excellence in Graduate Teaching and Supervision. Jorge Angeles, CIM member, was named a fellow of the IEEE. CIM's AQUA project was featured on CanadaAM, a nationally-broadcast news shown on the CTV network.